'I am about 41mm tall. My eyes are black, as is my hair, and my skin is yellow. I am a fully trained ninja and I live in a castle on the top of a large mountain. I enjoy riding, swimming, swordfighting and having adventures. I told him that this wasn't quite what I meant, but he said it was good enough and besides, you never know. So for the moment at least, that is how he will present himself to the world. Mr Ninja moves! See Mr Ninja Takes a Stand in Japanese with English subtitles. If you're reading this in December, why not get ready for Christmas with the Mr Ninja Advent Calendar? 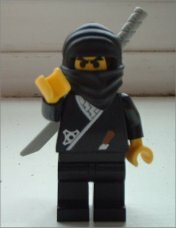 If you have any comments, or if you'd like to reply to Mr Ninja's advert, then you can get in touch with us by emailing mrninja at this domain. (Applicants should attach a recent photograph). All original work © 2001-2007 Claire Simpson. Thanks to Lego and Fujifilm for the inspiration and tools that make this possible.